If youâre as busy as I am, then these are great for breakfast. 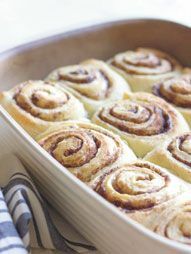 Just bake up a batch, refrigerate and grab in the morning. Sprinkle yeast into water. Stir in 1 tsp sugar and allow to stand 10 minutes until mixture begins to foam. Heat milk, remaining sugar, salt and butter in a medium size saucepan, just until butter melts. Pour into a large bowl, and allow to cool slightly. Whisk in eggs until well blended. Stir in foaming yeast. Beat in 2 cups of flour until smooth; stir in enough of remaining flour to make soft dough. Turn dough out onto a lightly floured surface; knead until smooth and elastic about five minutes, using only as much flour as needed to keep dough from sticking. Place dough in a large bowl, turn over to bring greased sides up. Cover and let rise in warm place 1 1/2 hrs or until double in bulk. Making filling by combining softened butter and brown sugar until well blended; stir in cinnamon. Divide dough in half, roll out to a 15×9â rectangle on a lightly floured surface. Spread half of filling over dough. Roll up jelly roll fashion, starting with short end. Cut into nine equal slices. Place cut side down in buttered 8x8x2â baking pan. Repeat with remaining dough and filling to make second pan of buns. Cover pans, let rise in a warm place 45 minutes or until double in bulk. Preheat oven to 375. Bake for about 15 â 25 minutes or until tops are lightly brown. Remove from pan while hot and place on wire rack over wax paper.